Living in a post-apocalyptic world is never what it’s cracked up to be, especially when dealing with hordes of zombies. What better way to counteract the boredom and impending doom of your existence than teaming with your band members, loading up your Gundillac, and killing some zombies with the power of METAL. This is exactly what Double Kick Heroes entails, developed by Headbang Club. This is a game that is most accurately described as a mix between Guitar Hero, Metal Slug, and a Tarantino movie. The object of the game, for each player, is to rhythmically press buttons to achieve weapon firing and combo multipliers. Using some brutal metal as the soundtrack, this game takes you on the ultimate destructive road trip through the wasteland shell of a United States. The band members are Lincoln, Snake, Derek, Randie, and James. They love Metal and can’t spend a day without it. Each one of them is a unique, cunning, metal player. Together in an apocalyptic world, they search for their favorite Rock stars are scattered all around the world. This game delves into their story and their hidden truths. *Your metal band, safely tucked away in their garage. 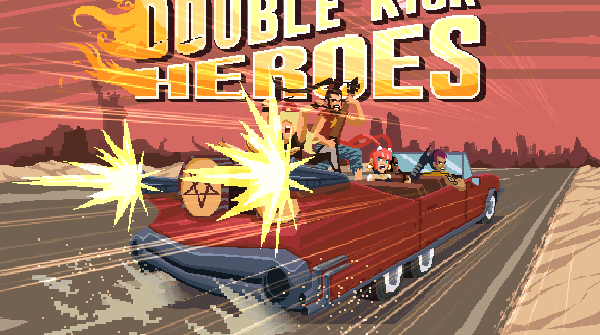 Double Kick Heroes uses pixel art that is more focused on presenting the carnage than looking or feeling “retro”, but that doesn’t make the arcade gameplay any less fun. The character designs move fluidly and have a great level of detail and variation between the different characters. Not only are the players designed well, but the landscapes which you drive through are also just as detailed and provide a greater look into this post-apocalyptic America. *A battle with what can only be described as one hell of a crazy train. 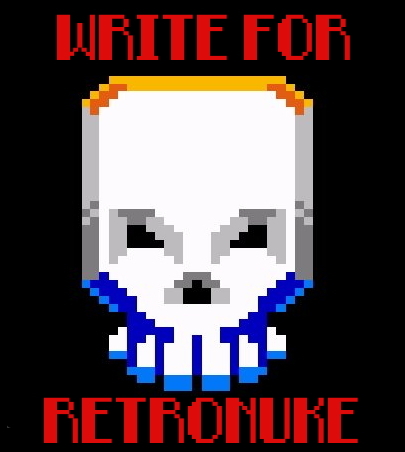 The game will pack in 30 songs, half a dozen chapters of adventures and a community level editor that will allow any music to be played to the rhythm of exploding zombie skulls. Exponentially increasing any replay value this game may have had before. Personally, I cannot wait for the player-designed levels to be released, that should be the most fun since new music can be uploaded to the game. Using a simple control scheme to rhythmically press buttons for your weapons, while simultaneously steering your vehicle does feel a bit cramped, but once you start to catch the timing of the songs, you begin to slay hordes of zombies with ease. Combined with the multiplier for successful chains, your weapons easily increase firepower to deliver more carnage to this unforgiving pack of undead groupies. *Even the sharks need a piece of the action. Speaking of music, this game seriously brings it. Using a highly decorated and experienced music director, this game brings the Metal straight to your ears with fast-paced gameplay and combat. There are 30 different original songs this game plows you through, each just as heavily METAL as the last. Each composition is full and promotes as much head banging as the gameplay can allow. The music is superb and compliments the quick gameplay completely. Seriously though, if you don’t like Metal, you probably aren’t going to like this game very much. You have been warned. My overall impression of this demo is a good one, the combination of music and gameplay tropes are a perfect fit for me and likely many other gamers out there. I’d never thought i’d play a rhythm based zombie-shooter, with an overall focus on a musical genre not really explored in games. And for that, it’s definitely worth your time. 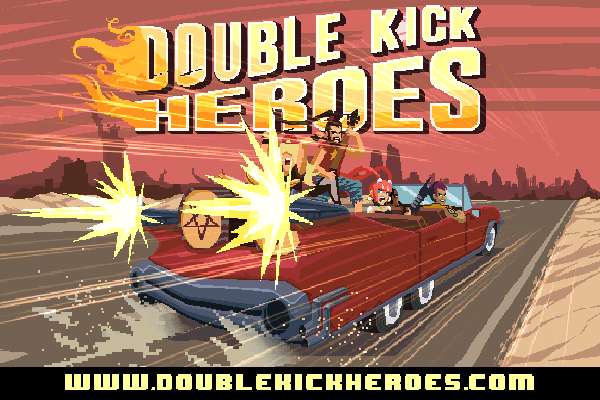 The Double Kick Heroes demo can be downloaded here!